Starting from Seers' Village, head north until you reach Rellekka, then head north-east until you find the dungeon entrance near to the mine. Enter and past through the second entrance within the cave to enter Keldagrim. To start the quest, you'll need to speak to Dondakan in the mining section of Keldagrim. Speak to the Dwarven Ferryman, who'll ask for 2gp to ferry you across (free with Ring of charos(a)). Once across, head south and around to find Dondakan by the dwarf cannon. Having spoken to Dondakan, you'll need to cross over the river again, and speak to the Dwarven Boatman. If this is the first time you've entered Keldagrim, a cinematic will play and you'll automatically start The Giant Dwarf. Having entered Keldagrim, speak to the Dwarf Engineer in the smithing shop in the western side of the Trading Consortium. 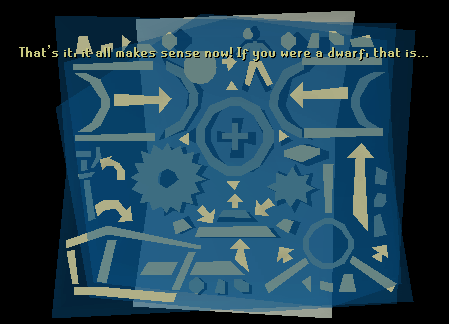 After speaking to the Dwarven Engineer, teleport to Falador and head north to the overworld part of the Dwarven mine. Speak to Rolad in the eastern building there. He'll ask you to find the missing pages for his manual. 3. found by mining ores in the mine - Coal and Adamantite rocks won't work however. Having found all the pages, combine them and head out of the mine and speak to Rolad once again. You can keep the book if you don't tell him "Of course" when Rolad asks to keep the book. Purchase the cannonball mould from Nulodion in the western building if you don't have one. Read the "Dwarven lore" book and return to Keldagrim. Once back, cross the river and speak to Dondakan by the dwarf cannon again. Suggest gold as an alterative to the materials he lists. He'll agree and tell you to make an prototype to test. You'll need to use a Gold bar on a furnace with a cannonball mould to create a golden cannonball. Once you have done that, return to Keldagrim and speak to Dondakan again, giving him the golden cannonball. 2. given to you by the Dwarf Engineer in Keldagrim, in the smithing shop in the western part of the Trading Consortium. 3. found after reading the "Dwarven lore" book to the last page. 4. give to you by Khorvak in the bar found under White Wolf Mountain (the passage opened by Fishing Contest). Give him a Dwarven stout and he'll give you the schematic. Whilst gallivanting about, use 3 Gold bars at an anvil furnace somewhere to make the Golden helmet. If for whatever reason you can't make a Golden helmet, assemble the schematic first (see below) and then try again at an anvil. If for whatever reason some anvils don't work, try an anvil at Keldagrim. Once you have all the pieces, click on "Assemble" on one of the pieces. You'll be presented with a jumbled mess that you'll need to adjust to make sense. Each schematic is a layer, so move the layer so the parts on it line up with the base image. Using the human parts to line them up is simplest. Remember to bring the combat gear, food and potions that you need to defeat a Level 75 to 125 Arzinian Avatar. Return to Keldagrim and speak to Dondakan whilst wearing the Golden helmet. Once inside the mine, mine 5 to 15 Gold ore - keeping them in your inventory (the more ores you mine the weaker the enemy will be). Head into the centre of the mine and pass through the two sets of flames (right click on the flames and talk to it). The Arzinian Avatar will appear. Kill it and remove the Golden helmet to leave the mine. 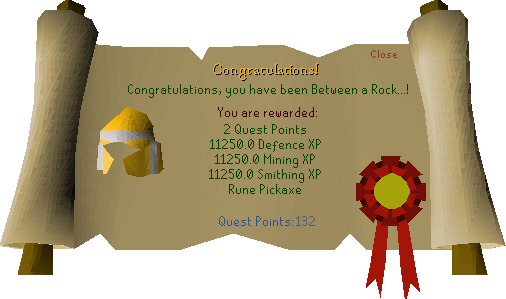 Speak to Dondakan to finish the quest. If removing the golden helmet does not eject you from the mine, keep it removed and log out and back in. Else, you will have to teleport out.